What to do if your pencil gets too short to use comfortably? I guess most people lose their pencils before this ever happens, but surely that won’t happen to pencileers, molyvophiles1 and molyvologues2. If my pencils reach the end of their useful length I’ll, more often than I should, put them aside – to be kept for an undetermined purpose in an undetermined future …but I could of course also put them to good use in a pencil extender. My poshest pencil extender, not counting the Perfect Pencil as it is also a sharpener, is the Motus pencil lengthener olive from e+m, Art.Nr. GS24-53. It comes in a black pencil box with two “pencils XS”, that are surprisingly smooth(! )3 writers. With about 15g (~0.5 oz) the pencil extender is fairly heavy. The handle is made of olive wood with, in my opinion, beautiful grain. The collar that holds the pencil in place is a metal screw-style collar. The space to hold the pencil extends into the handle so that my version of the Motus can hold 9.5 cm of pencil length in the pencil extender itself4, which means that even if your pencil hasn’t reached the stub stage of its life yet you can still use the Motus, maybe as a handle if that’s more comfortable for you than just holding a thin pencil. 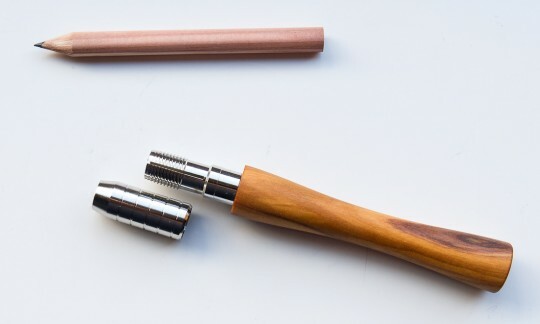 The Motus has similar proportions to other pencil extenders with wooden handles, but the handle gets wider towards the end. 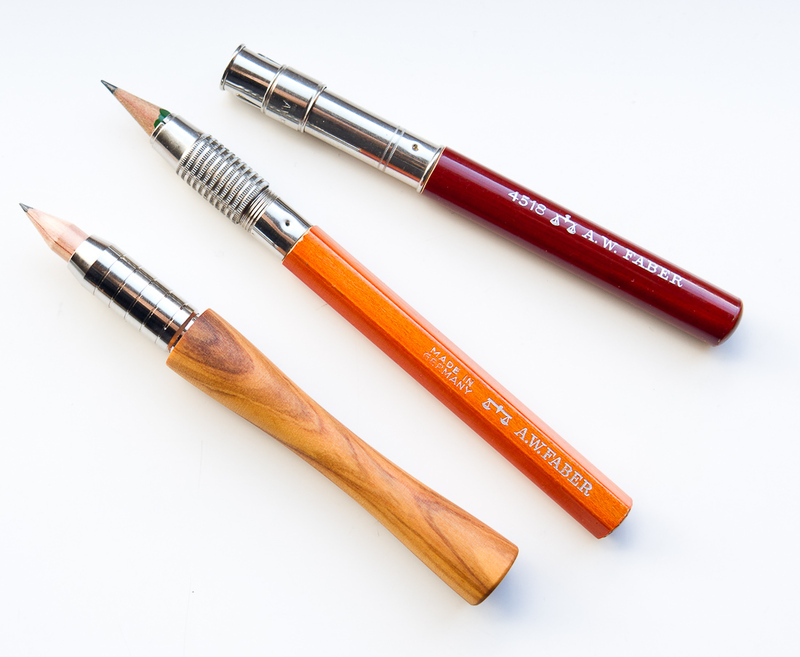 It is comfortable to hold near the pencil end of the metal collar or near the collar end of the wooden handle. Holding it in between is not comfortable as the end of the handle is too wide. This might be a problem if you don’t like to hold you pens close or far from the writing end. I bought the pen in April 2011 from Papier Pfeiffer in Würzburg, Bavaria, for €16,95 (~$22.05; £14.60). This shop has a fantastic choice of pencils, pens and stationery and I got great and friendly advice from the senior boss, Mrs Bienek-Pfeiffer, who had run the shop since the 1960s5 until she handed it over to her daughter. In all fairness I also have to add that I got less useful and less friendly advice when she wasn’t there and a member of staff was dealing with me. As mentioned before their selection is great, but there is also lots of stock, there are unusual items you won’t usually find, they even have their own, special products, e.g. special Papier Pfeiffer inks from De Atramentis6, and they also sell more expensive brands. 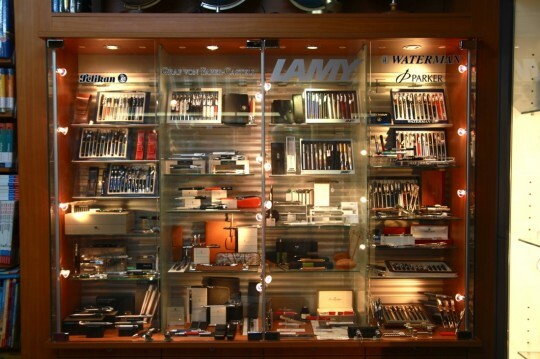 The e+m articles are in the fourth shelf under the Lamy logo. Click to enlarge. A great pencil extender. If you ware willing to spend that kind of money on an extender you’ll get one that is really good looking. This model is also available in black oak. 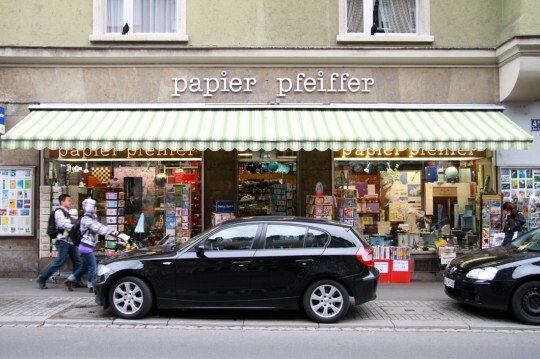 …and if you’re ever in Würzburg it might be worth having a look at Papier Pfeiffer at Sanderstraße 4a. 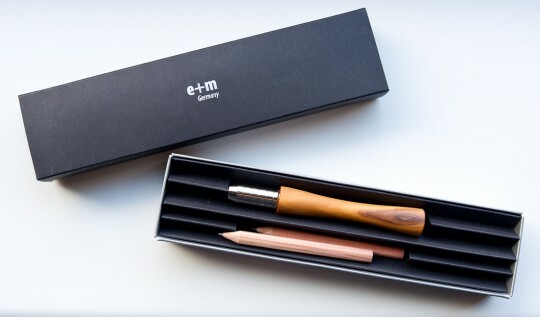 You can find a review of another e+m pencil extender at Lexikaliker (in German). You can find a blog post about Papier Pfeiffer at re:duziert (in German). Added after Michael’s comment: Cult Pens now stock a range of these extenders. This extender looks really nice – thank you for showing it! Do you have any details on the orange extender by A.W. Faber? Funnily enough, I have the same question as Gunther – I really like the look of those Faber extenders! For those in the UK Cult Pens now stock a range of these extenders. I have always used extenders – I’m too mean to waste expensive pencils, especially my coloured pencils and pastel pencils. For those I use the ones from Derwent – not as stylish but light and and inexpensive for my art box. I’ll have to put that shop on my list of places to see. Gunther and John, unfortunately I don’t have any information about the orange extender, as there is no model number printed on it. Just to let other readers know: I know about the red extender because in 2010 Gunther got more information about this extender from Faber-Castell. The red one is probably from 1932. The fact the there is no model number printed on it might indicate that the orange extender is from the 1920s, but this is just a guess. I think I bought the orange extander a few years ago from eBay seller “penciladdict”. Michael, thanks for this information. I should include a link to Cult Pens in the blog post. I haven’t tried the Derwent extender yet. There is a simple one from Caran d’Ache which is very cheap and nice, but because of the way it’s made it won’t work with all pencils – but it will work with “standard” pencils. If you’re in Würzburg anyway this is definitely a place to visit. There’s also a book shop in Würzburg with unusual stationery, but there are just a few different items as it is a book shop after all. Thanks for introducing this new pencil extender, Matthias. I use an E+M Endless regularly and find it the most comfortable to hold among the few extenders I own, including a Staedtler 900 25, a SLE「小次郎」 and one made by Ito-Ya, etc. I’m quite impressed by craftsmanship of the handle and the metal fittings on the Endless, and love the heft to it. Glad to see the same traits on this new piece from E+M. Regarding the ring type extenders, I have a question to those who use extenders like the AW Faber red above and Koh-I-Noor 1099: doesn’t the ring carve into your finger when holding it? Where should one place the fingers to hold it comfortably, on the pencil itself maybe? I’ve got the Staedtler 900 25, too. A search for a similar numbered Staedtler product made me first come across Lexikaliker’s blog. Even though it looks good I hardly ever use it though. I had a look at the SLE extender. I’m not sure whether there are different version, but the one I saw looks very nice! Regarding the extenders with a ring. I haven’t used them for a long period of time yet, but didn’t find them uncomfortable for short periods of time. I just rest the index and middle fingers on the ring. It would really be interesting to know what people think who use them for long periods of time.